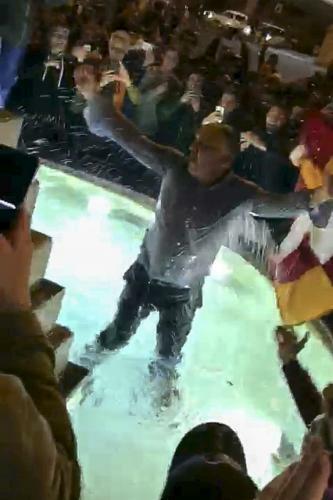 ROME – Caught up in the emotion of Roma’s stunning victory on Tuesday night, the club’s Chairman, James Pallotta, was seen celebrating by plunging into the Piazza del Popolo fountain, sources said. Pallotta personally apologised to city Mayor, Virginia Raggi, and has decided to make an enormous 230,000 euro donation to restore the Fountain of the Pantheon. The American-born businessman, 60, was at the centre of wild celebrations as the Italian capital went into a frenzy following their miracle comeback against Barcelona. 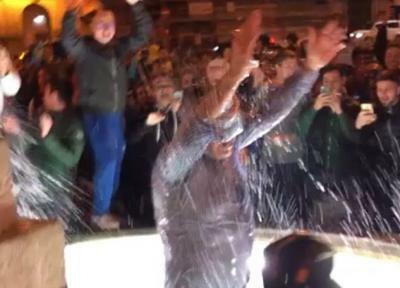 He was filmed diving into the historic Fontana dei Leoni where large crowds had gathered in one of many spontaneous street parties throughout the Eternal City. Pallotta’s made an apologetic call to Raggi, prepared to pay his fine, whilst the Mayor accepted that he was caught “in the heat of the moment.” She later thanked Pallotta for his “extremely generous gesture towards the city,” having met in person on Wednesday afternoon at Campidoglio where Pallotta made his offer.